Just recently I came up with this steak and mushrooms recipe from scratch. I had a few beautiful prime beef filet tails that I got from Flannery Beef and was scratching my head thinking what I should do with them. I remembered that I had a nice little stash of dried morel mushrooms that I could use. Steak and mushrooms really go well together so this seemed like an obvious match. 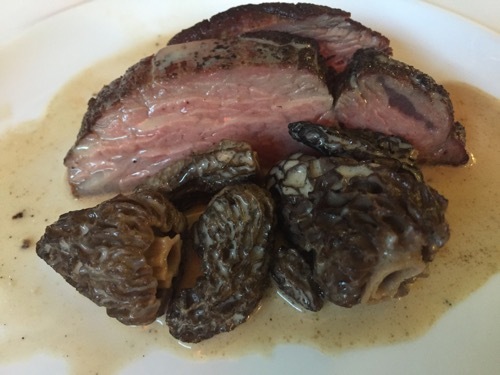 I really love morel mushrooms and they work well with creamy sauces like the classic Jura recipe I’ve made in my fireplace here. I thought I’d do something similar but with beef. You really could do the same thing with fresh morel mushrooms but I like how this turned out with the dried ones. I think they really add something because you can use the soaking liquid in the sauce which really adds another level of intensity of mushroom aroma and flavor to the dish, highlighting the meaty flavors nicely. This is definitely a maxed-out umami dish! Steak of your choice - I used a nice prime tenderloin tail from Flannery beef but you could really use any cut of tender beef that you would normally grill rare to medium. Mushrooms of your choice, sliced, about 2 cups or more - You could do this with simple ol’ white or cremini (baby portabella) mushrooms but you really could use any hearty mushrooms. I think this recipe is even better with dried mushrooms because the soaking liquid really kicks up the flavor of the sauce if you use it instead of water. I had a bunch of nice dried morels which are really a treat and they turned out sublime! Beef bouillon, enough for about 1/4 - 1/2 cup broth - I used a nice bouillon in a jar that I get at Whole Foods but you could use any type you like. Your favorite steak seasoning - Lawry’s Mediterranean Herb steak seasoning was really good but you could make any combo you like. Something like onion and garlic powder, salt pepper, dried parsley, thyme and oregano would do the trick. To taste, but I only had to use about 1/2 tsp. Take your steak out of the fridge to warm up to room temperature. If you are using dried mushrooms, soak them in close to boiling water for 15-30 minutes until soft. I used dried morels and I think they benefit from actually boiling them in water (just enough to cover) for 15-20 minutes to make them more tender. Drain and rinse the mushrooms but reserve the soaking liquid! Run this through a fine meshed sieve or coffee filter to get out any grit. Prepare about 1/4 to 1/2 cup beef broth (depending on how much sauce you like) by combining the mushroom liquid with the beef bouillon. Season the bouillon to taste with steak seasoning. It should be noticeably salty at this point because it will combine with the cream and dilute it a bit. Add the cream and taste again and adjust seasoning as needed. Get your grill going and get the heat to roasting, indirect heat cooking temperature (about 350 - 400 degrees F). Drizzle the steak with just a bit of olive oil and rub it to coat. Season generously with black pepper and salt. When the grill is ready, add the steak and cover. Cook over indirect heat until the interior of the meat is not done but starting to warm up, about 105-110 degrees, no hotter! A leave in digital meat thermometer is excellent for this. When the meat is at the right temperature, take it off the grill, cover with foil and let rest at room temperature. Next, open up the grill vents or turn up the burners to get the grill to high searing temperature. You can cook the mushrooms and sauce in a cast iron or other grill safe pot or pan placed right on the grill over direct heat. Alternatively, you can cook it inside on the stovetop. Once the pan is very hot, add a tbsp or two of olive oil, swirl to coat and add the steak. Sear it intensely on each side, just a couple minutes on each side to get a nice caramelized crust. You could do this directly on the grill if you want, but the drippings of the beef in the pan will add a lot of flavor to the sauce if you do it there. When well seared, remove from pan and set aside to rest again. Add another tbsp or two of olive oil if needed and add the mushrooms. Cook, stirring frequently for 3-5 minutes until softened and cooked through. Stir in the broth/mushroom liquid/steak seasoning/cream mixture and bring to a boil, stirring for just a minute or two until slightly thickened. Take off grill carefully with an oven mit (or two) and set aside. Now you just have to serve up the steak and mushrooms on a plate(s) by pouring the mushroom cream sauce over the steak. Thats it! Serve up immediately with whatever side you prefer, such as grilled veggies, rice or noodles. I hope you enjoy this steak and mushrooms recipe! Done with the Grilled Steak and Mushrooms Recipe page? Return to the Grill Recipes section.